The neighborhood had multiple concerns over the rezoning, including infrastructure and affordability. FLUSHING — The city has withdrawn a plan to rezone a portion of Flushing following concerns from the local city councilman, who compared the plan to "stuffing 10 pounds of potatoes into a 5 pound bag." City Councilman Peter Koo sent a letter Friday that urged the city to not move forward with their plan to create "Flushing West" — one of the 15 neighborhoods targeted for rezoning under Mayor Bill de Blasio's Mandatory Inclusionary Housing plan to create more affordable housing. Koo cited infrastructure issues, the environment and LaGuardia Airport's flight path in his letter — the latter which would limit the height of new construction buildings. "We need better transportation options, including wider staircases and more entrances to the 7 train, and a way to lessen congestion by MTA buses," he wrote in the letter. "Environmental and quality of life issues such as the need to truly clean up Flushing Creek and return the FAA’s flight path to pre-2012 routes were also highlighted" in his list of issues. The plan, he said in a later statement, was "a classic example of stuffing 10 pounds of potatoes into a 5 pound bag." The city proposed to rezone the area between 35th to Sanford avenue, between Union Street and the Van Wyck Expressway. In a letter also sent Friday, Carl Weisbrod, the director of the Department of City Planning, agreed that "it would not be prudent" to go ahead with the Flushing West plan. He told Koo they would instead focus on rezoning other neighborhoods in the city, which include East New York, the only rezoning plan to be approved so far by the city. The move was first reported by Crain's New York Business. 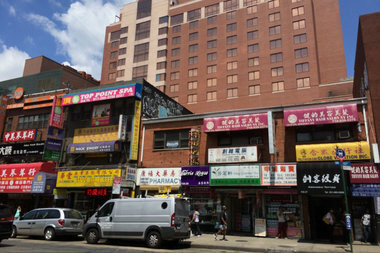 Flushing West is the first neighborhood to be scrapped from the city's rezoning plan. Elsewhere in Queens, de Blasio has eyed a portion of Long Island City for a "Core Neighborhood Planning Study." Not everyone was in favor of stopping the rezoning. On Wednesday, the Greater Flushing Chamber of Commerce released a statement saying they were "disappointed" the city ended the plan — and questioned the DCP's own commitment to it. "In Flushing, we don't run away from a challenging problem," said Simon Gerson, President of the Greater Flushing Chamber of Commerce. "We are a diverse community of hard working entrepreneurs, immigrants, and visionaries. In that respect, this unfortunate decision shows that the city never really made an effort to understand who we are."